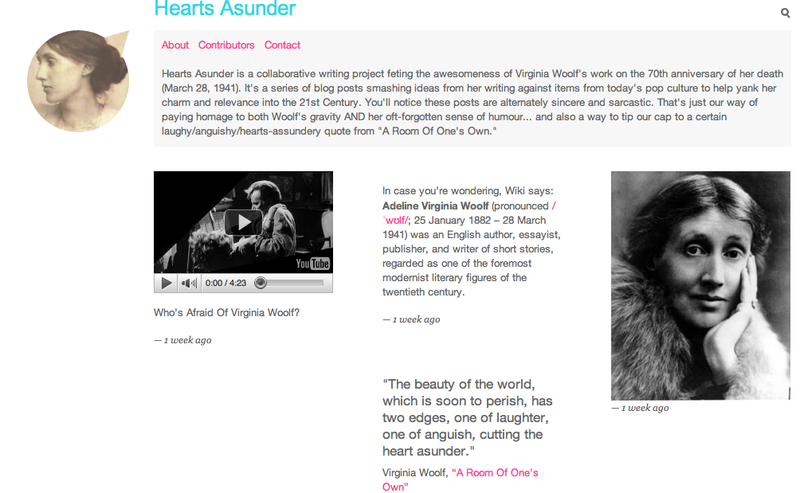 A new collaborative online writing project called Hearts Asunder launches tomorrow. It will use 400-word blog posts to illustrate the Woolf quote above by “smashing ideas from her writing against items from today’s pop culture to help yank her charm and relevance into the 21st Century,” according to creator Brianna Goldberg. The self-described “lit-loving Canadian writer and radio producer” will curate the project, which will run from March 1-28, the 70th anniversary of Woolf’s death. It is conceived of as a commemoration of her death as well as a celebration of her unique way of seeing the world as a double-edged sword that can incite both pain and laughter. Goldberg’s aim is to overcome a tendency many Woolf scholars deplore. That is the public’s proclivity to focus on Woolf’s sad, serious side — including her final walk to the River Ouse — to the exclusion of her witty, humorous side, including her incredibly productive life. Steven Daldry’s popular 2002 film The Hours‘ helped reinvigorate interest in Woolf and her writing. But it also reinforced the view of Woolf as a tragic figure, one reason why some Woolf fans and scholars panned the film. However, the film won a multitude of awards, including Nicole Kidman’s Oscar for best actress, the Golden Globes award for best drama and the best adapted screenplay honor from the Writers Guild of America. Since then, online interest in Woolf has grown. 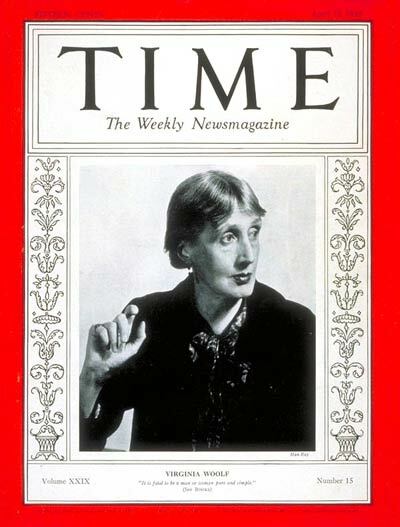 And while I have my doubts that Woolf’s charm and relevance need to be “yanked” into the 21st century, no one has launched a project that inserts Woolf into mainstream media and pop culture the way that The Hours did. As a result, the public impression of Woolf remains a serious one. Goldberg agrees, and she hopes her project will change that. “I believe Woolf has been absorbed into our culture as an overly dour, overly serious character. By pairing her work with items of today’s pop culture in this blog project, I hope we can help show the author and her work in a new light—one that celebrates her sense of humour AND her gravitas. And her relevance to the 21st Century,” she wrote in an e-mail. Blog contributors include a Canadian Stratford Festival actor, a baseball historian, a music critic, the star of a viral video comedy team, a mommy blogger and others. Goldberg says the writers have an interesting mix of perspectives and various levels of familiarity with Woolf’s work. “But they’re all excited and eager to learn more about VW’s work through this project—and really, that’s a main goal of the concept for me, too,” she wrote. Hearts Asunder is live now, and the full version of the Tumblr blog will launch tomorrow. See the RSS feed at the top of the right sidebar for links to the site’s most recent posts.